Conquer all evil that opposes the land of Rolotopia and defeat The Evil Hand that purges the place you once called home. If you have completed all the levels, try designing your very own campaign with the built-in level editor. Share your levels with your friends so that they too may bring piece to a fallen terrain. ZERO INSTALLATIONS REQUIRED. It's incredibly easy to play; even on the go, just have the latest version of Java updated on your system. I'm not quite sure why it took me this long to create this option. People have been requesting it since I first started Flack. 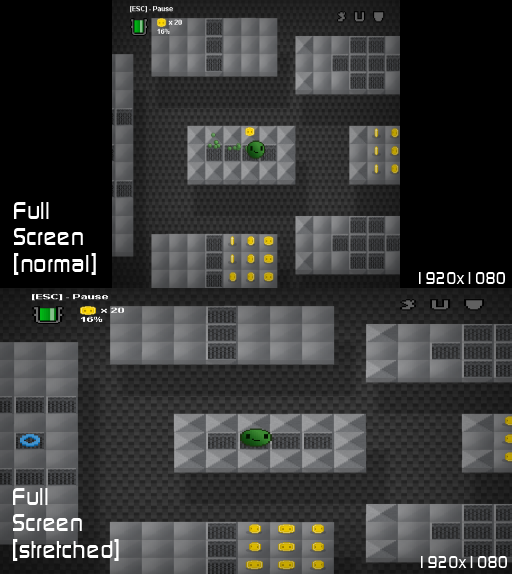 After many silly hours spent on creating and optimizing this feature, I present to you: Full Screen Mode. This part of the article will deal a little more heavily with the programming aspect. If you're not familiar with programming or Java's libraries, this might be a rough read. Yet that method exists nowhere. You guys are probably conjuring tons of ways in your head right now of ways you would make the game full screen right now, but if you've never actually tried it, you're in for a boat load of similar problems I had; problems such as performance, buffered images, and resolution. It was 3 in the morning and I was just about to go to bed. I had random thoughts such as: What should I do tomorrow? Why is my room cold? Why am I still awake? 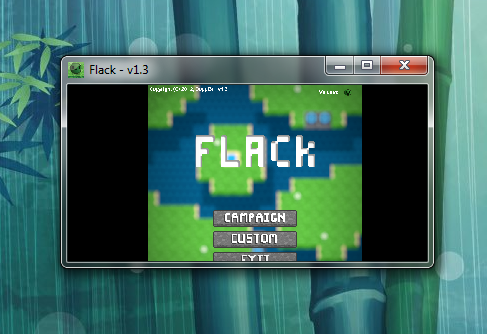 Yet the most random thought came to mind - What's a good way to make Flack full screen compatible? It hit me like a brick, I needed to simply use a buffered image to achieve full screen! I then hopped out of bed and began tapping away at the code. In shortened form, a buffered image takes a container of painted images or items and makes them into a usable image. By usable, I mean that you can literally do anything with this image such as stretch or shrink, which is exactly what I did with it. After the buffered image has been made, it is then positioned according to the screen size. For example, if the screen is not stretched it will place the buffered image directly in the center. Otherwise, the image will be placed at exactly 0x and 0y. Sounds easy! But what about if the game is windowed? How will that work out if 0x and 0y are different locations with the screen? There solution is similar yet needs just a bit more code to work fluently. The neat thing about this current build is that it can also be shrunken down properly. If for some reason you want to play Flack in a place you're not suppose to *cough class* then you can make it the size of a post-it note and play it at the same ratio. In conclusion, I would not recommend using JFrame for your games. If I had to be honest, I would have used the Java Slick library that is available out there. I say this because it uses the lwjgl and it's curved to aid developers with features like this. If I chose to use Slick from the start, I'm pretty sure this game would have been completed long ago. haha! As always, thanks for reading and I hope you enjoy playing and listening about Flack! 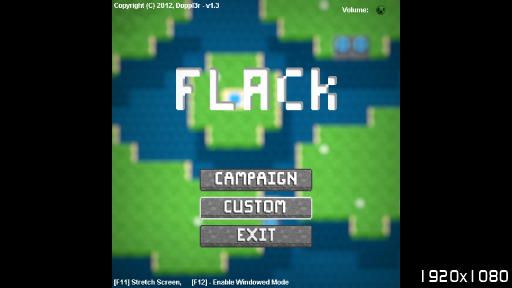 Flack v1.2 update has improved the game in many ways. Check out this short 20 second video to see what's new in the world of Rolotopia! 4 unique items have been added to Flack and can now be exchanged with coins at The Keeper's Shop. In this update, players will be given the option to try out the new Random Level Generator included in the custom section. 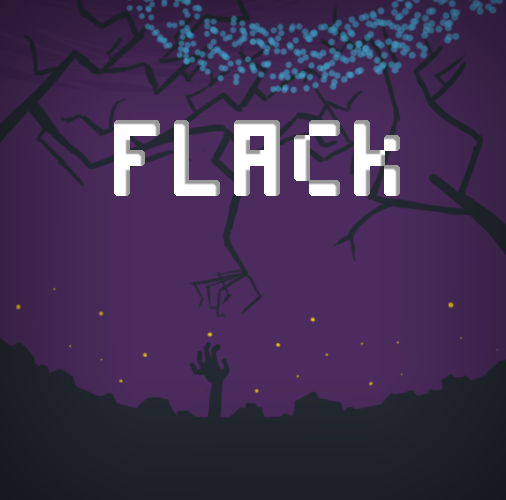 This is the demo for Flack. It includes 2 levels from 2 chapters within the campaign along with the option to play randomly generated levels. This is the 5th test release. It has bugs. I know what they are. I don't feel like fixing them at the moment. Have Java installed to play! O boy! Interesting, I'll try it out on my ubuntu-emulator sometime soon. Previous versions seemed to automatically work. Thanks for the feedback! I had the same problem as him on Ubuntu 12.04. Is there/will there ever be gamepad support? I actually haven't considered this until you mentioned it. I know that it's possible to do, so I'll just have to look into it. It would've been 20x easier to implement if I chose to use the Slick2D library...curse my impatience! Honestly the quality is that of a decent flash game. Not something I would pay money for. Point being why buy this when I could find free games of equal and better quality on say... newgrounds or something. I guess you are right on some points. Yes, the game might be doable in Flash, but let's go further than just looking at the game. Since Flash's Actionscript is a script language, it is most likely much easier to use than Java, which means that more work has been put down in this game than what would be needed in a Flash-version. So, when I bought this, I did not only see it as me buying the game, but also helping out an aspiring developer, whom might develop my future favorite games (who knows... xD). Because Doppler is a pretty active developer, free games developers can take months to release even minor updates. You're essentially paying for constant free updates, plus it's only £2, it's great value. Played the demo. Seems fun. The only thing I didn't like was the size of the screen. Could be bigger. Tomorrow I shall buy it! 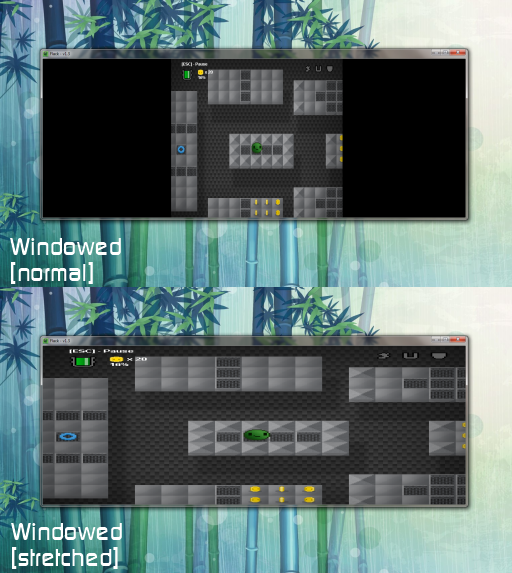 As of version 1.3, you can now choose to play full screen, or custom windowed resolutions. I might make this available in the demo, but we'll see. A very interesting game that somewhat challenges the gamer. The only draw-back about this game is that the controls are just a bit iffy. Other than that this game is pretty good.